Recently a client with whom we have never worked before, asked us to estimate the survey of a medium-sized hotel. The objective was to measure and to represent the external areas, the shape of the building and the 4 elevations, which, given the articulated shape of the various volumes, would not have been easy to measure with distanciaometro and rib. During the preliminary interview that we usually do to try to understand what level of detail and accuracy our client expects to receive, we were asked if a topographic survey performed with a total station was not sufficient, during which we could also measure some points of the façades, rather than a 3D relief laserscanner, which according to our interlocutor would certainly have been more expensive. But is it really more expensive, in a situation like this, to use a 3D laser scanner? We try to understand this by making some considerations on the two different working techniques. In general, and with the necessary exceptions, a topographic survey with a total station allows to obtain greater precisions, above all if performed using relief techniques that allow to minimize the errors inherent to the acquisition of the measurement, compared to those obtainable using a 3D laser scanner. .
On the other hand, using a total station allows to obtain the measurement of only one point at a time, thus extending the time of data acquisition in the field. The lower number of points beaten, obliges the detector to integrate the topographic data with direct measurements, taken directly on the object of the survey by means of ribs and tape meters, handwritten in the form of sketches. Another aspect to be taken into consideration is related to the number of operators required to perform the survey. Even if there are total robotic stations that allow you to create surveys even in the presence of a single operator, usually work in pairs. An operator assigned to the instrument and a second who is responsible for identifying the points to be detected and positioning the reflecting prism. The post processing of data is very fast, and is performed by processing the measurement booklets with special topographic software that allow you to calculate the coordinates of the beaten points and transfer them to the CAD environment for the subsequent representation of the graphic information. 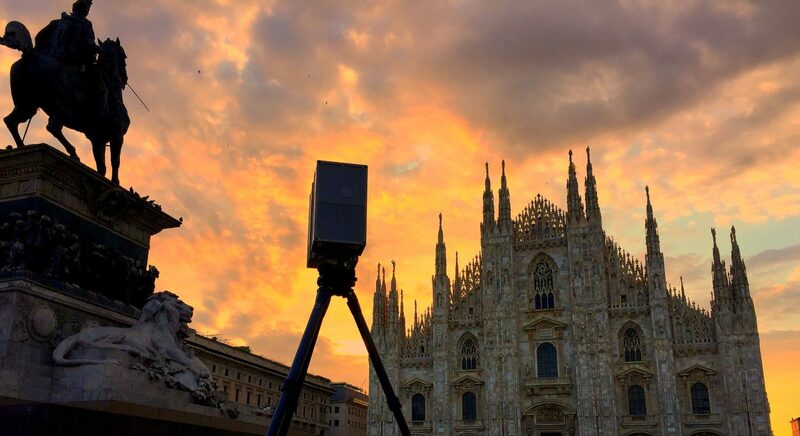 The main feature of the survey with 3D laserscanner is that the time of acquisition of information in the field is drastically reduced. These tools are able to acquire up to a million points per second, with a very high grid density of points. This allows to minimize the time spent in the field, with positive repercussions in terms of travel costs and downtime. The possibility of acquiring data at 360 ° horizontally and 320 ° vertically allows obtaining a complete spatial information set, avoiding the detector having to integrate the data with further information. The survey can be easily performed even by a single operator, as the instrument acquires data autonomously without the need for external intervention. The overall accuracy of the acquired data is slightly lower than the topographic survey, especially if you acquire more point clouds from different points of scans and then you have to combine the different clouds in post-processing. The post processing of data is longer than that performed for a topographic survey, having to proceed with the filtering of point clouds, their registration and extraction of the data necessary for the graphical representation. When performing medium / large sized projects, it is always appropriate to use both techniques, in order to exploit the respective advantages of each. In these cases, we prefer to topographically detect a network of control points, so-called ‘targets’, which will then be used to record and join the scans performed with the laser scanner. This method allows to maintain a high overall accuracy of the survey, without losing the advantage in terms of acquisition speed typical of the laser scanner, since the topographic survey is performed only on some points and not on the entire object of the survey. A survey like the one requested by our customer is not more expensive if performed with a 3D laser scanner. The greater amount of time required for post-processing of data is offset by the higher speed of data acquisition, which is normally more expensive than office work. The total timing is therefore the same, with the great advantage of being able to have a quantity of geometric information not even comparable with those obtainable with a total station. In the case of architectural surveys that are expected to be returned to the scale of 1: 100 or 1:50, the accuracy of the information acquired with the laser scanner, even if it is slightly lower than that obtainable with the total station, is largely sufficient. So the answer to our customer’s question is that the choice of the technology used, in a case like the one described, does not affect the costs or the overall times of the project. The use of a laser scanner, however, allows to obtain a completeness of geometric information that is impossible to obtain with other instruments. ⟵5 ways to increase the survey accuracy.